"Everything is, I thought, a simulation." He's one of the hottest stars at the moment and is about to make his mark on science fiction playing android David in Ridley Scott's Prometheus - Irish-German actor Michael Fassbender. I've been following his career closely ever since Hunger and Fish Tank, proclaimed his performance in Shame last year as one of the best of the entire year, and would say that his performance as David in Prometheus is quite memorable. I finally got the chance to sit down one-on-one with Michael Fassbender in London last week for a quick interview on Prometheus, androids and his career. Read below! 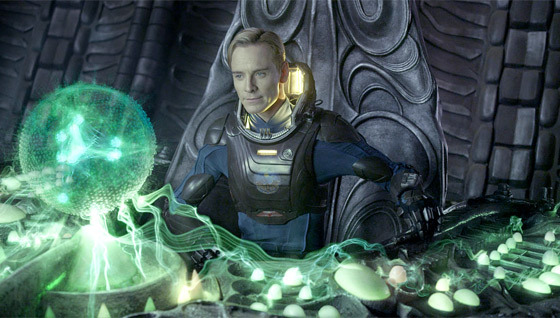 I've been anxious awaiting an opportunity to actually interview Fassbender, and it couldn't have worked out better to happen with Prometheus, since I'm a science fiction geek and have been going crazy over how great this movie is (our video blog). Fassbender is as charming, down-to-earth and suave as he comes off in all of his roles, and was fantastic to chat with in person. Always excellent on screen, nice off-screen, he's an actor who has quite a phenomenal career ahead of him, not to mention all of the great work he's already done. We chat a bit about his career choices as well as how to play an android in Prometheus, so let's get right into it. What makes you choose particular projects and why exactly did you choose this? What was it that really interested you, whether it was playing an android, or working with Ridley Scott? Fassbender: It's always down to the script and the director. They are the two things that I use as a decider, really. In this case it was obviously Ridley. And then the script was just really original in its structure, in its theme, and the way it was sort of executed for such a commercial film. A lot of the times the scripts can be quite formulaic, you know what's going to happen by page 15… you've seen it all before. This, I had no idea what was going on, right into the third act. It sort of gave me enough information but didn't lay everything on the table. So yeah, that was that really. Were you worried about the idea of the android being too much of a spoiler to begin with, or just part of the universe and story? Fassbender: Yeah, I mean it wasn't a secret like in the previous films. It was obvious that he was a robot, so I decided to sort of go along that route instead of trying to make him physically sort of human; and kind of accentuate his sort of mannerisms and his physicality. What does it really take for you to get into character on set? The costume, the set itself? Fassbender: Well, it's basically the same thing all the time. I just spend a lot of time with the script. The script, I read it, reread it, reread it, reread it. And then sort of various ideas — Ridley had sort of suggested that I take a look at The Servant with Dirk Bogarde. There's obviously the Lawrence of Arabia sort of reference that's there, in the script, his sort of fascination with that character. Then there was David Bowie, The Man Who Fell to Earth. I watched Blade Runner again, something sort of about Sean Young's replicant [character Rachael], I thought there was something interesting I could take from that. And then Greg Louganis for the physicality. I don't know why I thought of him, but he kind of popped into my head, his physicality, that odd sort of walk. I always remember him at the edge of a diving platform, but also very focused and very efficient; you know, very lean in terms of movement. What else did you speak to Ridley about and how else did hone your character beyond what was just in the script? Fassbender: Yeah. Whether he's… is his objective programmed or is he starting to develop his own motivations? And that's with everything — we kind of played with everything; he's just a big walking question mark. That's the idea. So that's how we kind of sort of went about it. With Prometheus and your android character David specifically, I loved your performance in it because every piece of what you did—your movements, your responses, your reactions are all calculated, obviously from mechanical/robotic point of view. How are you able to play that kind of character when we all know "acting is reacting"? How were you able to play such a calculated performance yet add the emotion and liveliness that we find in your character? Fassbender: You know, I don't know. I always sort of liked the idea that he was two or three steps ahead of everyone. And that's not always the case. Like when [spoiler removed], that surprises him and he's impressed by her. He's interested by her at the beginning; there's some fascination there. Her faith, her sort of… there's a resilience to her. But it's her sort of openness and passion, I think he finds it intriguing. But, it's always an internal dialogue going on with any character, so he's reacting to stuff that's going on even though he's not talking about it. But it's like everything is, I thought, a simulation. So, gather the information and process. All the time it's about him sort of gathering information. There's a childlike quality to him. You know the way kids, they are discovering stuff new all the time. So I like that idea with him. Because it's like, oh, so when humans are having a joke with one another, he can't understand it. He's trying to. So the next time he'll understand it when he sees that. So he's processing, taking information. That's kind of his main thing. That's what he's all about. So even with the little sort of altercation with Holloway, that's for the benefit of science. It's information. He needs to sort of see what it is. The fact that he picked Holloway, it could be sort of personal, you know [laughs]. But he needed a guinea pig and he happened to present himself. Part of that is the idea is that as an android you are emotionless, but you are able to respond with some emotion. In the film it comes from learning emotion and learning to understand emotion through the movies and through other people and their interactions. I think that's just a fascinating idea to see it play. Fassbender: Yeah. Again, Ridley had a major part to play in it as well. Just the idea, and I didn't even know myself, is he starting to develop human stuff… As you said: as the crew becomes more alive and he's around them more, or has he been sort of masking it and playing more of the robot? You know, there's so many things that I was thinking, "Okay, what has happened to the programming here?" Because he is one of the earlier models. Is there some sort of bleeding affect that's happened and his programming is starting to work organically and he's developing his own sort of tributary effects of his programming, sort of turning out to be like a human personality trait? So is that envy, or vanity there, or insecurity? He sort of gets left out of the group, does he feel hurt by that? So always playing that—not 100% sure, but is it there, is it not? It's like what you were saying earlier about being steps ahead of people. How do you diversify your career at this point? I already really like your diversity in characters anyway, you're never the same in each movie, so how do you continue to diversify your career? Fassbender: Well, touch wood. [Laughs] I don't know. I'm always looking for different stuff. It's, obviously, you do something, let's say, like Inglourious Basterds, for example, and then another character like that will be offered to you, because people see you doing something and they're like, "All right, so he can do that." So you just have to make sure you try not… Well, I just try not to do the same thing. I try not to sit back into a comfort zone. Just try and keep pushing the limits. And there is, obviously, a limit. There's certain things that I just can't do. Well, not can't, but there's plenty of other actors out there that do a better job at it. But within my sort of range, I'm trying to find the boundaries. And it's just trying to sort of learn as much as I can, continue that sort of learning process. But yeah, just seeking it out, really read the scripts and not accept anything and everything that comes your way. I don't know. It is a gut feeling a lot of times with the script, you know. And then, as I was saying, you rightly asked is it a director thing as well? That is a big deal. Speaking of directors, what have any of them told you that have been the most pertinent and poignant tips to you in your life? Fassbender: Well, seeing as that we're talking about Prometheus, I'd say Ridley. I really was just inspired watching him work with his crew, with each department, and speaking with each department in their particular language. And, you know, his idea of "just do it" — I loved it. It's more my philosophy. Instead of talking about it, just put it on its feet and take a look at it because that's going to be the best indicator whether it works or not anyway. The last question I want to ask is what are the biggest inspirations in your life, whether it's performances, other actors, artwork, other movies? Fassbender: Yeah, my knowledge of the art world is pretty crap, I have to say. You know, definitely massive influences on me when I was sort of starting, when I was sort of 17, was [Marlon] Brando for sure. Still. I think he was sort of… I mean the best is always sort of like kind of like crazy to say, because this is subjective and it's sort of art, or whatever. But for me, he was, you know — just pretty amazing. Obviously, the usual suspects — [Robert] De Niro, [Al] Pacino, Scorsese movies, Coppola movies; a lot of the American movies from, like most people [laughs], the late ‘60s right through the late ‘70s, that was kind of really very inspirational. And then music, of course, always is, too. Fassbender: Thanks, man. Appreciate it. Thank you to Michael Fassbender and everyone at 20th Century Fox for coordinating and arranging. It was an honor and pleasure to talk with one of my favorite actors. 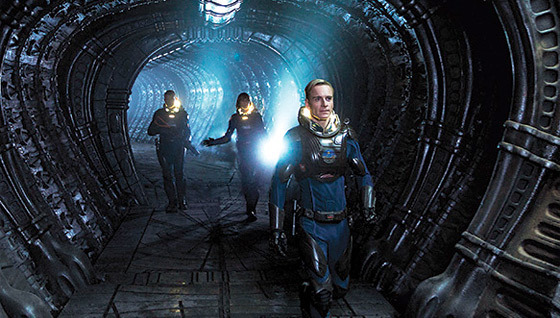 Ridley Scott's Prometheus arrives in theaters in 3D in the US this weekend, starting on June 8th. Go see it! 'There's certain things that I just can't do... But within my sort of range, I'm trying to find the boundaries.' the man is almost indecently modest. great interview, Alex! you really get a sense of the care he takes with his craft. Great interview Alex. He is one of my favourite actors - along with Tom Hardy - at the moment. People should see his film Eden lake,trippy stuff. He's great in Prometheus. But great in the same way LAnce Henrikson and Ian Holm was. Also, people find him superdupergreat in it because everyone else were so bland.